You are currently browsing the tag archive for the ‘engagement’ tag. On November 22, 1903, 21-year-old Franklin Roosevelt asked 19-year-old Eleanor Roosevelt to be his wife. Eleanor accepted, but Franklin’s mother, Sara, opposed the match, believing her son was too young to marry. She convinced the couple to keep their engagement secret for a year—hoping their ardor would cool. It was nearly a year before Eleanor received this engagement ring on her birthday, October 11, 1904, and several months more before she and Franklin announced the engagement. The ring is special for more than sentimental reasons. It is one of the earliest known examples of the Tiffany style setting, which revolutionized jewelry design by raising the diamond above the ring band to allow light to hit the stone from all angles. 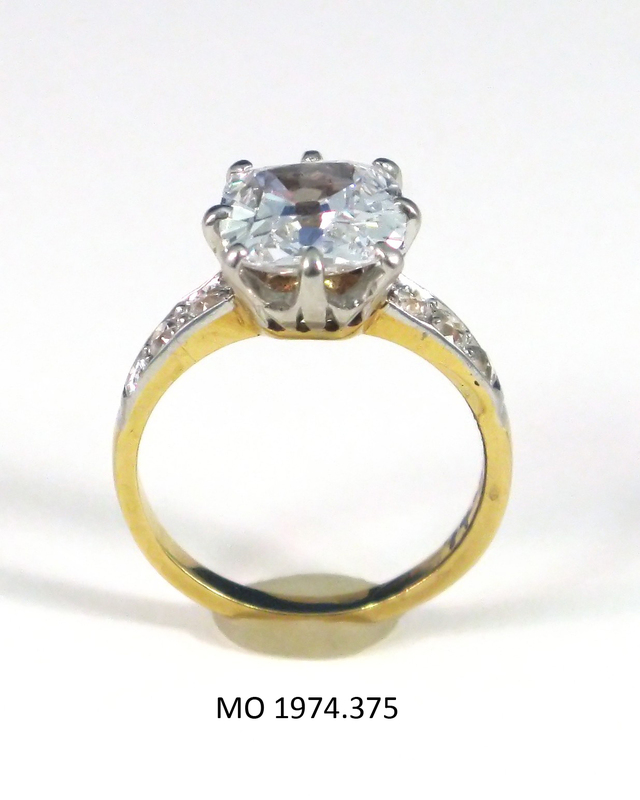 The center diamond is very slightly imperfect and weighs approximately 3.40 carats. The six diamonds at the sides weigh about .30 carats each.